I've waited to send out Amelia's birth announcements, because with the price of postage, I couldn't afford to send out her birth announcements and Christmas cards so close together. Therefore, I combined them, and one side is her side and the other is our Christmas card. I wanted to share the birth announcement side with you all today, before I even mail them out! I think it's so cute, and you all were so supportive during my pregnancy, delivery and hospitalization, that I wanted you to see it first. Sharp eyes might recognize the background pattern of the card as Amelia's nursery drapery fabric. 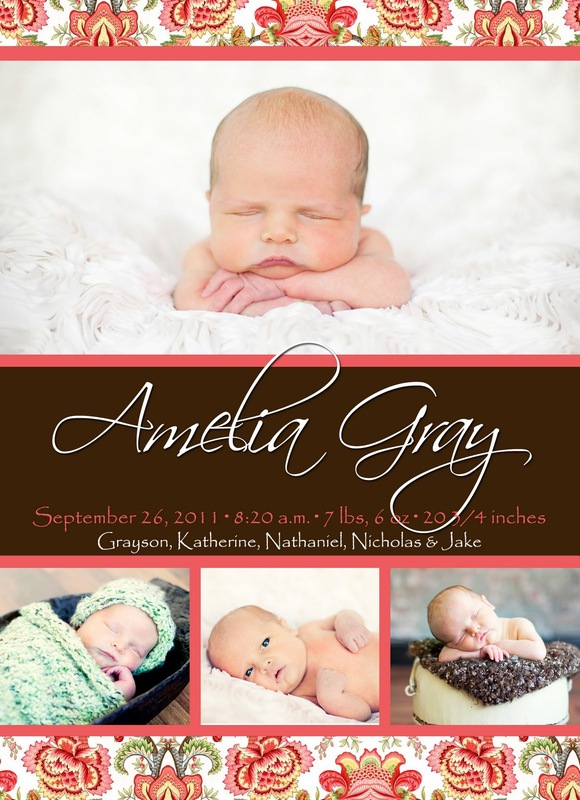 And our last name was watermarked behind "Amelia Gray" on the card, but I had that removed for the Web version. My beautiful inside-and-out friend Heather designed them as a gift to me and gave me her wholesale printing price. What a wonderful gift! These are gorgeous!! That is such a smart idea to combine the two! I love all of the pictures. So sweet! Great idea using one side for the announcement and the other for Christmas. I've said it before and I'll say it again: man, you guys make some pretty babies. Precious! I love her sweet face! These sharp eyes did notice the curtain pattern, but not before noticing the ultra cuteness of that baby girl! Can't wait to get my hands on her this weekend!